Oceans of Fun Seal/Sea Lion Show, sponsored by Supercuts, welcomed a male California sea lion, born June 20, to mom, Makaia. The pup, named Colby, is Makaia’s sixth offspring. Both Makaia and Colby are doing great! 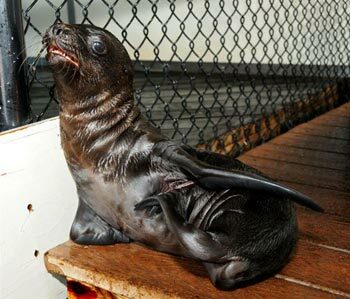 California sea lions don’t know how to swim when they are born. During the next several weeks, Oceans of Fun trainers will help Colby master swimming as he learns to dive, hold his breath and blow bubbles in his kiddie pool. When he’s ready, he’ll be introduced to deeper depths and he’ll actually have swimming lessons in Oceans of Fun holding pools, before he is allowed to swim in the main pool. Colby will make his Oceans of Fun Show debut sometime in early August. In the meantime, Colby spends lots of time playing with his toys, splashing around in his kiddie pool, nursing from mom Makaia and interacting with his trainers. 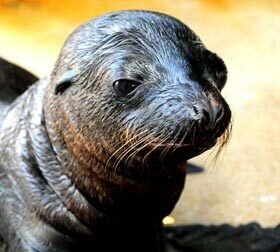 The Oceans of Fun Seal/Sea Lion Show, sponsored by Supercuts, runs daily at 10:30 a.m., 12 p.m., 1:30 p.m. and 3 p.m. Admission is $2.50.